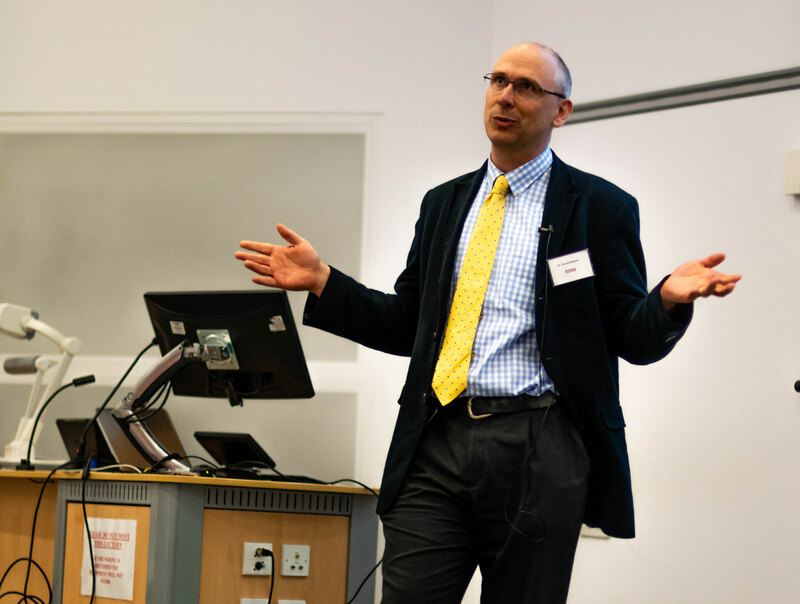 The SCAD research in Leicester and across the world is moving forward on various fronts, so Beat SCAD caught up with Dr David Adlam and Dr Alice Wood to get an update. “There is lots going on, with some areas gradually coming to fruition,” says Dr David Adlam, who is leading the SCAD research at the NIHR Biomedical Research Centre, Glenfield Hospital in Leicester. The genetics study, ‘Association of the PHACTR1/EDN1 genetic locus with spontaneous coronary artery dissection’, is quite technical, so to help understand it, click here to watch this video where Dr Adlam explains the findings. Findings from the Optical Coherence Tomography (OCT) study, which relates to the mechanism of SCAD, are expected to be published in March. Dr Adlam and Prof Alexandre Persu (Cardiology Department, Cliniques Universitaires Saint-Luc, Brussels and Lead for the European FMD Registry) are collaborating on a paper regarding coronary tortuosity. A manuscript from the pathology study is being written and will be focused on informing pathologists of SCAD and how to make an accurate diagnosis. Analysis of imaging data is ongoing, working towards publication. The research team will be contacting some SCAD patients for an update on their condition. This will take the form of a brief email, phone call or request to complete a short online follow-up survey. Data collected from this follow-up is essential for understanding patient outcomes. 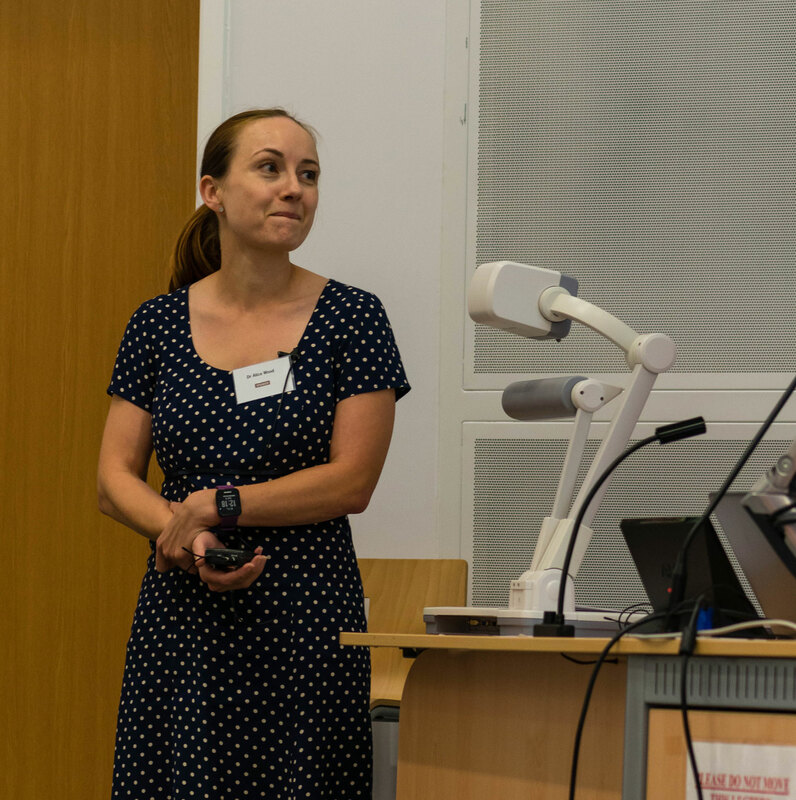 Dr Alice Wood, Clinical Research Fellow (part funded by Beat SCAD donations), introduced us to the importance of studying sub-groups, including male survivors and those who have had recurrence, at the Beat SCAD Conference in June 2018. Click here to watch the video. Dr Wood is making great progress and is 30% through studying the male SCAD sub-group and has recently started studying recurrent SCAD cases. If you are a SCAD patient who fits into any of the sub-study groups and have already registered your interest in participating in research, you do not need to contact Dr Wood. Dr Wood first needs to assess the availability of medical records and imaging before contacting potential patients about participating. If you receive an invitation to participate in the research or to complete a survey, please respond at your earliest convenience – including if you decide not to participate so that the team can update their records and avoid further unnecessary correspondence. We suggest adding the research email (scad@uhl-tr.nhs.uk) to your address book/contacts. Please check your Junk/Spam folders sporadically in case any communication has been filtered out of your Inbox. The research team are only permitted to make three attempts to contact you via email. If the team try to contact you by telephone, the call will show as a private or withheld number. Survey data is crucial to the research – your help to return complete data in a timely manner is greatly appreciated! Do you know any male healthy volunteers willing to help the research? 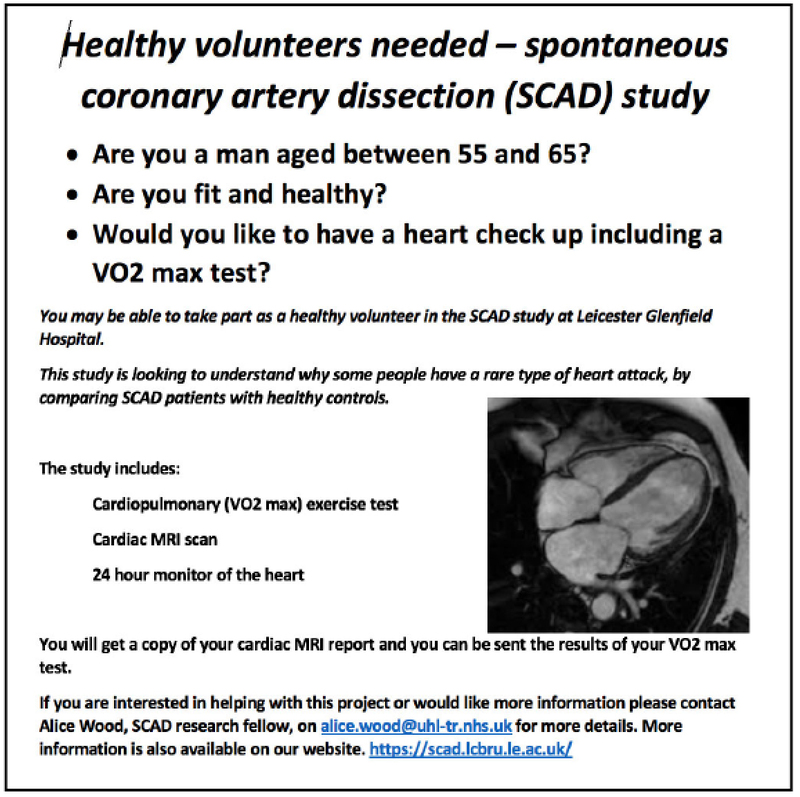 Dr Wood is looking to recruit men aged 50-65 who are healthy (i.e. have no known diagnosis of cardiac disease) and are not genetically related to a SCAD patient. See picture below for further details and how to contact Dr Wood. If you haven’t yet registered your interest in the research and would like to, please click here to follow the instructions. If you have previously registered and would like to update your details or have further questions, please email the research team on scad@uhl-tr.nhs.ukrather than re registering.